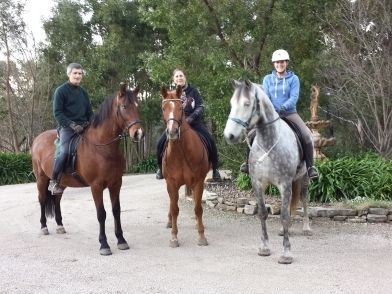 Master Trainers Barrie and Sarita Stratton offer world class horse riding and classical dressage lessons for riders using their highly schooled horses and riders with their own horses wanting help and they also train horses for clients. In addition they teach working equitation holding Funday Sundays, modern trick horse training, and all ground work and are In Hand specialists. Private and share lessons, for adults who can already ride. Indoor and outdoor facilities in the beautiful Adelaide Hills in South Australia, country, Interstate and overseas. A unique experience, different from anywhere else! We hope we have the opportunity to help you have some fun while you realise some goals and dreams! Visitors are always welcome to observe! We are very happy to pass on our extensive knowledge and passion gained over 37 years of professional experience. We specialise in Dressage and work with riders in a straight forward and easily understood manner with attention to detail. We offer a personal and caring service. Come and have a look. All prices available on application.